Starting today, all AWS customers can start optimizing their cloud resources by using four of AWS Trusted Advisor’s most popular best-practice recommendations on service limits and security configurations. Access to the four free checks does not expire, and you can access the remaining 33 checks and additional features by upgrading to Business or Enterprise-level Support. AWS Trusted Advisor acts like your customized cloud expert, and it helps you provision your resources by following best practices. Trusted Advisor inspects your AWS environment and finds opportunities to save money, improve system performance and reliability, or help close security gaps. Since 2013, customers have viewed over 1.7 million best-practice recommendations in AWS Trusted Advisor, and they have realized over $300 million in estimated cost reduction. The four free checks, available in the AWS Management Console, help you build a more secure and responsive cloud environment: Security Groups - Specific Ports Unrestricted, Service Limits, IAM Use, and MFA on Root Account. The Service Limits check (performance category) centralizes information about major service limits across multiple AWS products, and it alerts you when you use more than 80% of their allocation of resources such as Amazon EC2 instances and Amazon Elastic Block Store (Amazon EBS) volumes. 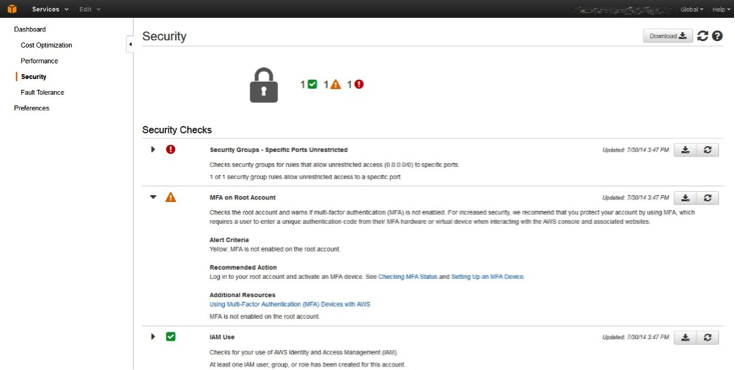 The Security Groups - Specific Ports Unrestricted (security category) alerts you to overly permissive access to your Amazon Elastic Compute Cloud (Amazon EC2) instances and helps you avoid malicious activities such as hacking, denial-of-service attacks, and loss of data, which can result in loss of productivity, and potential legal and financial implications. The IAM Use check (security category) alerts you if you are not following security best practices by creating users, groups, and roles to control access to your AWS resources instead of using your account credentials. The MFA on Root Account check (security category) recommends that you use multi-factor authentication (MFA), which improves security by requiring additional authentication data from a secondary device. You can configure Trusted Advisor notifications to receive weekly email about any changes in their check results. You can also subscribe to Business and Enterprise-level support to access the full suite of Trusted Advisor best-practice checks, API access, and a host of other support features, such as phone and chat access to support personnel, architecture guidance, API access, and help with third-party software configuration. 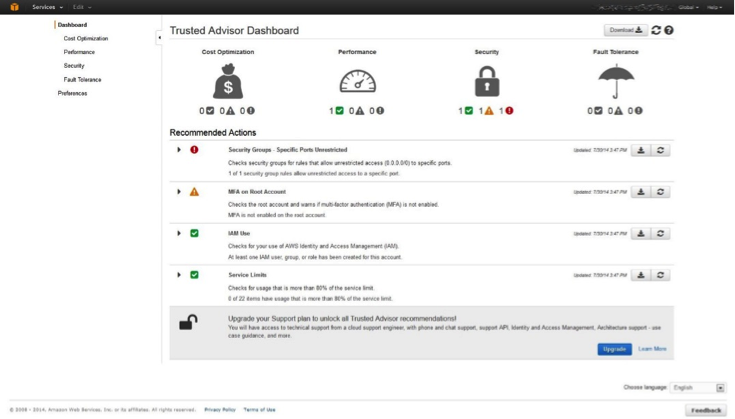 View your AWS Trusted Advisor report right now from AWS Management Console. 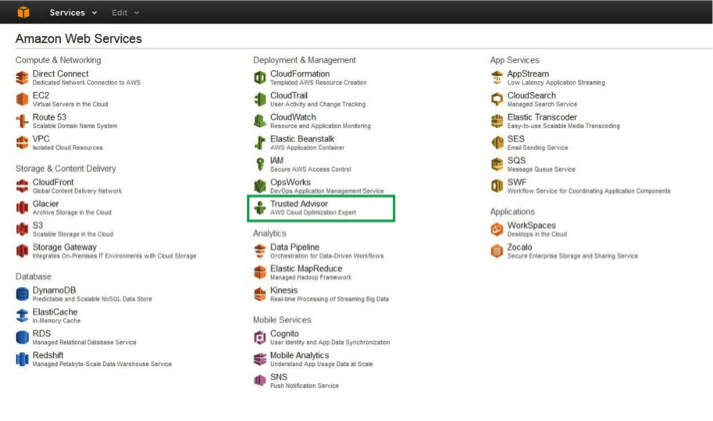 For more information about AWS Trusted Advisor, visit http://aws.amazon.com/premiumsupport/trustedadvisor/.